Business income is the MOST important property coverage any insured can buy. Discover how simple the coverage really is during this 3-part web series. This 3-part series is broken down to three, 1-hour sessions which may be viewed at your convenience. US Fire Administration and National Fire Protection Association (NFPA) statistics indicate that between 115,000 and 130,000 business-related structures suffer fire damage every year; that's one structure every five (5) minutes. Between 25 and 33 percent of these business never reopen or close shortly after reopening, not because of the lack of property insurance but due to the lack of or improperly designed business income protection. Without income, no business can survive very long. Insurance agents and brokers either fail to sell or improperly structure business income coverage; setting their clients up for business failure following a major loss. Business income and/or extra expense are the MOST important property coverages any insured can purchase; and the coverage is not nearly as mysterious as agents believe. 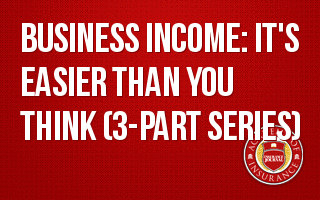 Remove the mystery and discover how simple business income coverage really is during this three-part Web series." Gain a better understanding about how to recognize a dependent property exposure and how best to protect the insured from these loss exposures. Guide to Understanding Business Income Coverage ($40.00 value). In this class the dreaded business income worksheet (CP 15 15) is clearly broken into its component parts so that it can be easily understood and easily explained to your client. Upon completion of this session, there shall remain no reason to be frightened of the worksheet. Coinsurance in time element coverage is nothing but a function of time. Calculating coinsurance is easy - once you have calculated the Period of Restoration. It's calculating the period of restoration that's hard. This session details all that must be accomplished during the period of restoration and how that period is longer than you think. Once you know the period of restoration, coinsurance and limit calculation is easy. Two topics are detailed in this third session: 1) Extended Business Income; and 2) dependent property coverage. Students learn that returning to operational capability is not the same as returning to pre-loss operational income levels. Because there still exists a loss of income upon return to operational capability, students learn how to insure the difference between pre-loss income and post-restoration operational income. In the second half of this session, students learn that many of their insureds depend on the existence of other businesses for the economic survival of their business. What happens if the business on which your insured depends suffers a catastrophic loss and your insured suffers financially because of it; is there any way to cover that loss of income? Yes, and students learn how to protect your insured's potential financial loss resulting from another party's direct loss.